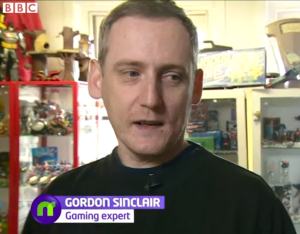 Despite being relatively inept at games, my claim to fame is that I have been lucky enough to be called on by the BBC on a number of occasions, to provide expert opinion for both television and radio shows. I have managed to get my mug on the channel’s lunchtime and evening news bulletins as well as their flagship children’s new programme. Unfortunately I wasn’t able to complete the set with a spot on the BBC Breakfast red sofa, but I live in hope. You can see clips of some of these interviews by following the links below. BBC Evening News – 21st February 2013 – Has the games console had its day?